A unique feature of Mozilla Firefox and its Gecko-based browser cousins is the Profile Manager, which allows each user to have multiple Firefox profiles (where bookmarks, add-ons, and other user data are stored). This is very useful to developers and testers – they can use separate profiles to try new browser versions or add-ons without risk of corrupting their regular profile. A user can also have different profiles for different purposes – one set of bookmarks and/or add-ons for work and another for personal use, for instance. Many users don’t know about it, though – profiles are in a hidden directory by default, and the Profile Manager is also hidden, accessed by command line. Not without cause, either; serious data loss hazards exist for those who create profiles in the wrong location, then delete the files with the Profile Manager. Profile files are created directly in the folder specified, when not using the default location. Deleting the files removes everything in the folder. Some have even wiped their entire system partition! Aside from a strong warning in the profile creation dialog, though, it remains the same as it’s been since before Firefox 1.0. That’s supposed to change soon. Mozilla is planning to remove the Profile Manager from Firefox, “after Firefox 4.0” (How long after is not clear). When this change is implemented it should speed up starting of Firefox – since it will no longer be loading the hidden Profile Manager at startup – as well as eliminating a data loss hazard. As a replacement, A couple of Mozilla developers have created a new external Profile Manager. 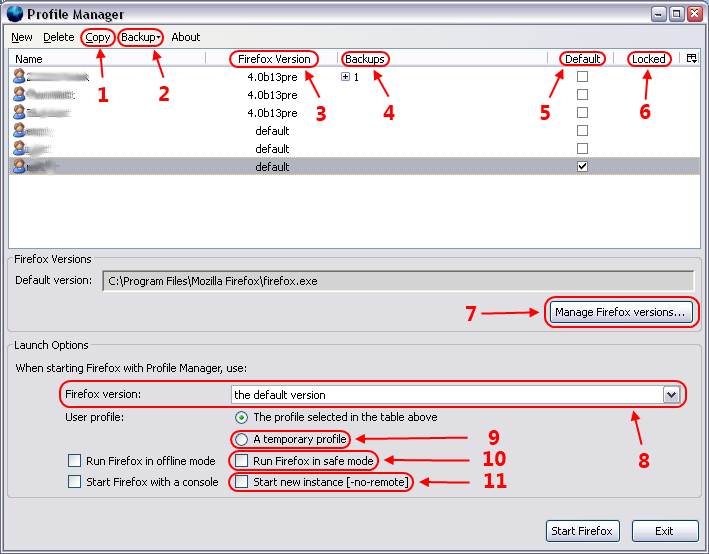 “Copy” creates a clone of the selected profile – a duplicate with a new name and path. The “Backup” dropdown has options to create a backup of the selected profile or restore a previous backup – can be in this program’s backup folder or a Zipped archive anywhere you select. The Firefox version associated with each profile – right-click on a profile gives the option to change this. Default here means Firefox 4.0.1, set using #7 below. “Backups” shows how many backups ahve been made of each profile; clicking + shows the date and time each backup was made. “Default”, in this case, means the profile last used – the one Firefox will automatically use if opened without the Profile Manager. A checkmark in the “Locked” column shows the existence of a parent.lock file, which normally indicates the profile is in use – if it fails to go away when the browser is closed, it has to be deleted before the profile can be used again. The “Manage Firefox versions…” button opens a window where you can tell the program about another Firefox version you’ve installed, or delete one from its list; it’s also where you set the default browser version. This shows which Firefox version is currently selected, and allows you to change it without changing the selected profile – you can temporarily override the profile association setting this way. Opens the browser with a clean temporary profile for debugging. Opens the browser in Firefox Safe Mode, which disables all add-ons and customizations – another debugging tool. Opens a new instance of Firefox when one is already running – the same as using the -no-remote command parameter. You can have different versions or different profiles running in separate browser windows at the same time. The external Profile Manager runs in XULRunner, Mozilla’s runtime for XUL apps. XULRunner is included in the download, which makes it a pretty big package, about the size of Firefox itself. It does have one bug that I know of – if you change the “Default” profile in this program, SpywareBlaster no longer detects Firefox is installed. To fix this you have to launch Firefox from the old Profile Manager once. Most Firefox users have no real need for a profile manager – a profile is generated automatically for each user account on a computer when Firefox is first launched, creating a new one just requires deleting the old one when Firefox isn’t running, then starting Firefox. Deleting the Profile Manager will just make Firefox leaner, faster, and safer for the average user. For the testers and developers who’ve longed for more features in the Profile Manager, the new external version gives them just what they’ve been asking for. Looks like it will be a win for everybody. You don’t have to wait if you want to try the new Profile Manager, it’s available for download right now. No data loss bug, either, it makes a new folder for every profile it creates.